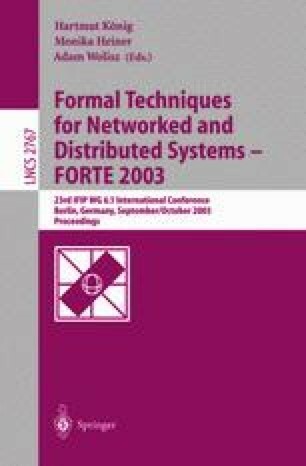 In this paper, we propose a testing method for QoS functions in distributed multi-media systems, where we test whether playback of media objects is correctly implemented or not in a client side program according to the quality designated in advance, and/or whether a time lag between parallel playbacks of multiple media objects is controlled within the specified time interval. In the proposed technique, we describe test scenarios in timed EFSMs where we specify behavior of an input flow transfered to a given IUT (implementation under test) and behavior of playback with certain QoS functions observed from the IUT (e.g., the range of fluctuation of frame rates) . From the scenarios, we generate test sequences to test whether a given IUT realizes the QoS functions specified in the scenarios. In the proposed test method, we use a statistical approach where test sequences take samplings of actual frame rates and/or time lags when an IUT is executed, and report test results from ratio of samplings with low quality below a threshold in a normal distribution of all samplings. We have implemented a test system for test sequence execution in Java, and applied it to a video playback system.